Skip the traffic and make plans to hop on DCTA to get to the 2019 Thin Line Festival. As the official transportation sponsor, we’re hosting a free ride promotion in which festival-goers can ride the A-train and Connect Bus system at no cost with code word “ThinLineFest19” from Wednesday, April 10, through Saturday, April 13. As a reminder, parking is free at all DCTA A-train stations and the agency does not operate service on Sundays. To take advantage of DCTA’s free ride promotion during the Thin Line Festival, event goers must tell DCTA bus drivers and rail operators the event code word “ThinLineFest19” to ride free. The only services that qualify for DCTA’s free ride promotion are the A-train and Connect Bus system in Denton and Lewisville. For more information about DCTA’s Thin Line Festival free ride promotion, visit RideDCTA.net. 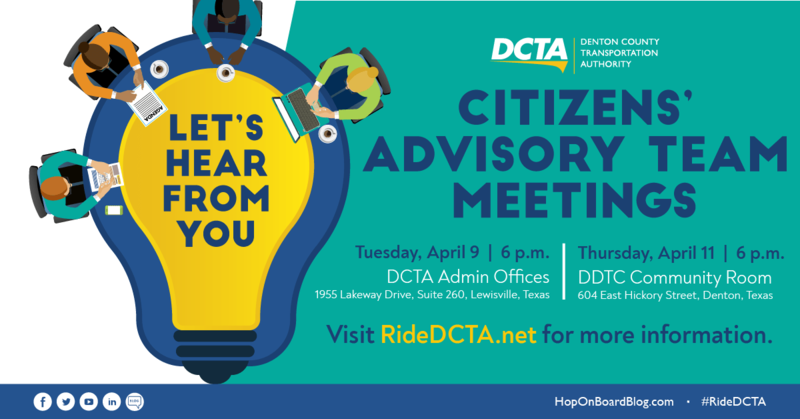 Want to meet with our staff and hear the latest on DCTA news? Have a recommendation you’d like to give us? Well, this month is your chance to do just that at our April Citizens’ Advisory Team (CAT) meetings. Our Citizens’ Advisory Teams provides a forum to exchange information between our staff, passengers, and the community on transit-related issues. Public participation is critical as we continue to expand the public transportation opportunities available in the region. R.S.V.P in advance to Kelly Briggs, DCTA Community Relations Manager, at kbriggs@dcta.net. This event has been CANCELED due to impending inclement weather. People across the U.S. will kick off the spring trail season by visiting their favorite trails for a walk, run or ride in observance of national “Opening Day for Trails,” and DCTA is joining in on the spring fun. We’re partnering with the city of Denton, Lake Dallas, Corinth, Highland Village and Lewisville to host a “Rails to Trails” event on Saturday, April 13, from 9 a.m. to noon to get residents out and moving on its A-train Rail Trail to kick off the spring season. DCTA will provide free A-train rides to all “Rails to Trails” event attendees. Getting a free train ride is simple! Just say the event code word “Opening Day” to a DCTA rail operator to ride the A-train free all day on Saturday, April 13. DCTA will operate regular A-train service during the event. 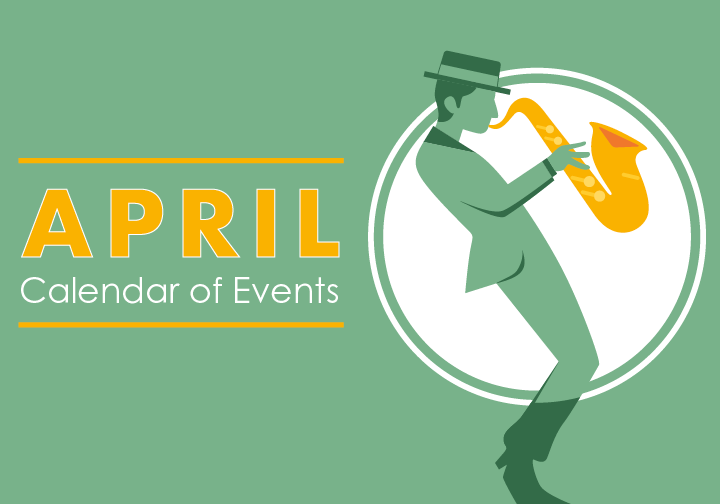 Heading to the Denton Arts & Jazz Festival this year? Skip traffic and ride our free shuttles for all the fun music, activities and food! We’re providing free shuttle service for the festival Friday, April 26, through Sunday, April 28. Anyone can ride our free shuttle service that will pick up passengers from the MedPark Station and Texas Health Presbyterian Denton (still pending) and drop them off at Quakertown Park (festival location). The shuttle will run every 30 minutes. We will host meetings in Denton, Highland Village and Lewisville and will have an online presentation that people can view if they can’t attend the meetings. More information can be found at RideDCTA.net. Excited about all our upcoming events and free ride promotions? Share us how you plan to get involved with DCTA this month in the comment section below. We’d love to hear from you! Are there any alternative plans for the “rails to trails” event this Saturday with the forecast showing storms now? Hi Robert, thanks for your question! Unfortunately, we have canceled the event this Saturday due to the impending inclement weather but plan to reschedule for June 1, which is National Trails Day. You can read more about the cancelation here: http://bit.ly/2VC0yO9.